Warning, do not use the above Venn Diagram. We can make it better for you. I have been passionately fascinated about why human beings do what they do since childhood. Part of my motivation came from wanting to understand why my family was so painfully dysfunctional and how I could avoid as much pain as possible in order to survive my younger years. But, it wasn’t long before I became equally fascinated by human excellence, kindness, love, and the higher values of human contribution, such as our purpose and meaning. It soon became obvious that human beings are incredibly complex beings. Venn Diagrams are very helpful tools in helping us understand complex relationships of various concepts. 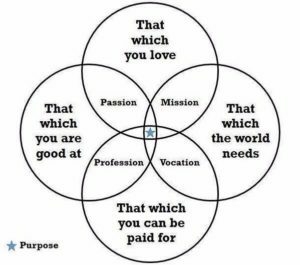 The above Venn Diagram has been very popular on social media and for good reason, it is very well done, rich with insights and can be very informative if a person would actually work the process to answer each of the implied questions in the four circles. Yet, in my opinion, it is not good enough for you to use. 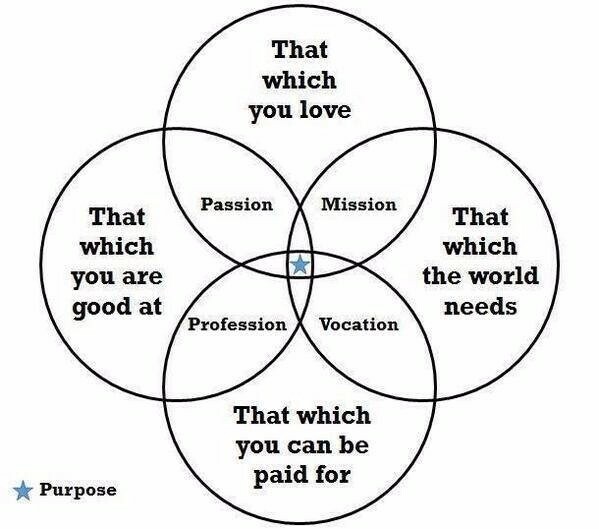 Since finding purpose represents the very foundation of what I help provide for my clients, it may not surprise you that I have some fairly significant changes to this particular Venn Diagram that I believe will serve you well. The problem with “That which you are good at” is this: it often identifies an area of competency (a place you have mastered a skill, gain particular set of knowledge, etc.) and as a result you are good at that particular area. People appreciate your contribution, and that appreciation feels good…for a while. Soon, the area of competency area starts to get old. For example, I happen to be blessed with high math aptitude. When I started my first business, I excelled at doing business projections. My bank affirmed the results of this skill with admiration and appreciation. I could read financial statements and Income statements with ease, but when it came to the daily repetition of documenting the data to support the financials, I found it mind numbing and intensely boring. I could do these tasks accurately and well, but there was no enjoyment in them at all, and the tasks were intensely mentally draining. After an hour or two of “crunching the numbers,” I had nothing left in my tank for what I truly enjoyed doing. I later found out that I lack a talent for routine, predictability and consistent structure. When you are able to identify an innate talent, you can then develop that talent into a powerful strength. When you use that strength, you experience increased energy and focus, you can see the impact you are having, you experience higher satisfaction. You can actually experience flow where you lose a sense of time and you can experience joy. Here’s a reality that some find hard to believe: you are uniquely and immensely talented. You have amazing talents that have the potential to be developed into powerful, life changing strengths. You have strengths that are highly valued in the corporate world, in your community, and in your family. The problem is, you may not be aware of your talents. Most people aren’t.